“No, ga-hrose! Ham Balls?” Yeah, my sister didn’t hold back when I told her I made them. And that gross was a whole two syllable gross! Too bad she’s so far away coz I know I could convert her with these little lovelies. They’re the real, deal Iowa Ham Balls with Sweet Sour Glaze, heritage style. No soup or ketchup or any weirdness at all. Just good down-home scratch cooking. Whaaat? You’ve NEVER had a Ham Ball? Then you’re probably not from Iowa and probably didn’t grow up with them. And you’re probably missing out. Think of pure comfort food, kinda like meatloaf but with ham and ground pork, spiked with the warm holiday flavors of clove and allspice and lovingly napped with a sticky sweet/sour sauce that’ll knock your socks off. Plus, there’s that name. Ham Balls. It might easily lead your mind south in a way that Meatballs don’t. And now, your mind probably just went there. See what I made you do, lol! Well, these aren’t those kind of balls. Which makes me wonder, what DO they do with those? It makes me wonder, too, why meatball sounds so good and ham ball sounds, well, maybe not so much. I’m in a mood, I guess, so forgive me. If only we had some of these Ham Balls left, I’d be eating them instead of getting into trouble on the internet. Seriously, it’s hard to stop. Serve them hot from the pan with something carby and delish like mashed or baked potatoes and a simple side – broccoli would be good. 🙂 If you want to be really down-home, add a slice of white bread and some butter to the party! But as good as the Iowa Ham Balls are, it’s the Sweet Sour Glaze, that steals the show. If you don’t come from an area like I did, that was settled in part by German ancestors (so many came over in the 1890s) you might not be that familiar with this type of sweet/sour flavor; you might be more familiar with the Asian type of sauces but the similarity ends there. In the Midwestern versions, the Sweet/Sour Sauces are usually a combo of vinegar, brown sugar and dry mustard and they’re wonderful, especially with ham and pork. My Grandmother’s Old Fashioned Ham Loaf is sometimes served with one (it’s an option at the bottom of the recipe.) So are these Sweet & Sour Country Style Ribs in the Slow Cooker, Instant Pot or Oven. These Ham Balls make a bunch, so come hungry. They freeze well & are a great use of leftover ham. They’re easy peasy to make (bonus, I know) especially if you have a food processor to pulse up the ham into fine shreds (or maybe you have a meat grinder? Use that.) If you can’t get good ground pork, do the same with some loin or shoulder. And don’t worry when your Ham Balls are pinkish in the middle. That’s how they’re supposed to look, not an indication of how done they are. If you’re a feeling particularly kitschy (And by that, I mean retro!) serve these in a tiny size at your next party. With toothpicks or kept warm in a slow cooker. And now my sis is going to call me and really let me have it. Because even though they’re delish, we always make fun of meatballs at parties; they can be so overdone. Of course, that’s usually, after we’ve gone to a party and eaten a lot, lol!! The cost of this recipe really depends on the cost of your ham, which is usually so dirt cheap during many of our holidays, as well as the cost of ground pork, which is never cheap in my area. Heck, it’s not even always available at the store. Since it’s made from pork shoulder, one of the cheapest meats there is, I sometimes just chunk some up and pulse it in the food processor. If you’re not a baker and don’t keep brown sugar around, you might not have molasses, either. But a great substitute at a fraction of the cost of brown sugar is a little white sugar and about a tablespoon of molasses. You don’t even need to mix it together like you do when you Make Your Own Brown Sugar. Save your stale bread to make your own breadcrumbs. Just freeze it as it accumulates, or pulse it into crumbs and then freeze it. They always come in handy. This recipe will make 18 good-sized ham balls, allow 2 to 3 per person. To make the glaze, mix the brown sugar with the mustard powder. Slowly add the vinegar, whisking well as you pour it in. Set aside & whisk again before using. Preheat oven to 350 degrees. Grease or spray a 9 x 11″ pan. Combine ham, pork, breadcrumbs, egg, milk, and spices. Mix only until combined. Shape into roughly 1/3 cup sized balls (divide mixture into half, then each half into 8 portions.) See note, below, on mixing. Place in greased baking pan (the fit will be close) and bake for 30 minutes, covered. Uncover, add glaze, and bake for an additional 45 minutes, basting every now and then with the glaze. (the glaze will smell strongly of vinegar as you baste – don’t breathe in and don’t worry, the strong vinegar smell/flavor will dissipate.) The balls should be looking shiny and somewhat brown when done. Note: the ham, pork & breadcrumbs can all be pulsed up in the food processor. Chunk up and pulse a bit at a time until broken down. I normally pulse up the ham, add some of the ground pork and whirl it a few times to combine, then mix all ingredients together. It makes for a more cohesive ball when made in the food processor. I’ll be bringing Iowa Ham Balls with Sweet Sour Glaze to our very own Throwback Thursday as well as to Fiesta Friday. Our Fiesta Friday co-hosts this week are Caroline @ Caroline’s Cooking and Tânia @ Iwanttobeacook. This entry was posted in Click here for Bargain Meals, Click here for Fabulous Food Posts and tagged Bargain Meal of the Week, Family Recipe, German, Ground Ham, Ground Pork, Ham, Heritage Recipe, leftover ham, Pork, Pork Shoulder Recipe. Bookmark the permalink. I love your sense of humor lol. These balls look really good, I’m definitely going to try this recipe 🙂 thank you for sharing. Want to try these yum! You’re right Mollie– count me in the people who had never heard of ham balls (until now!) They do sound scrumptious! We’re having a ham for Christmas breakfast– see if you have any leftover to grind up and use! And— I feel like I’m getting to know our sister just reading your blog! Are you keeping warm– we keep hearing amazing temperatures from the mid west!! Happy Christmas there! Oh and I forgot – the ham balls are great, try them if you have leftover. And my sis is a hoot and my best friend. Next to Chance, lol!! And once it’s 23 below, well then 10 below doesn’t seem so bad and above zero feels like a heat wave!! Hey Mollie– OK, I’ll let you know if I get them made! And I’m sitting here with my daughter out from Wisconsin and I read your weather comment to her. She said that’s so true! You must be intrepid Mollie! Christmas hugs! Oh, I bet she’s happy to be there! My son & I just got back from dinner & shopping a little while ago…now curling up with Chance & an electric blanket, lol!! Thank you for sharing that recipe! Oh, really?! Hamballs exist?! 😂😂 Hey, I’d eat them, especially if they look exactly these. Seriously, they look really, really tasty, Mollie. Maybe it’s the glaze. It’s all in the glaze, lol. I think it’s a GREAT idea for leftover ham. Mollie, you’re a genius! Ha, Angie! Yes they exist – just like Santa Clause! So maybe I’m finding my Xmas spirit! They’re an old heritage recipe and I think they’re probably handed down from the German pioneers in Iowa, so no credit to me – although I have a few special touches! 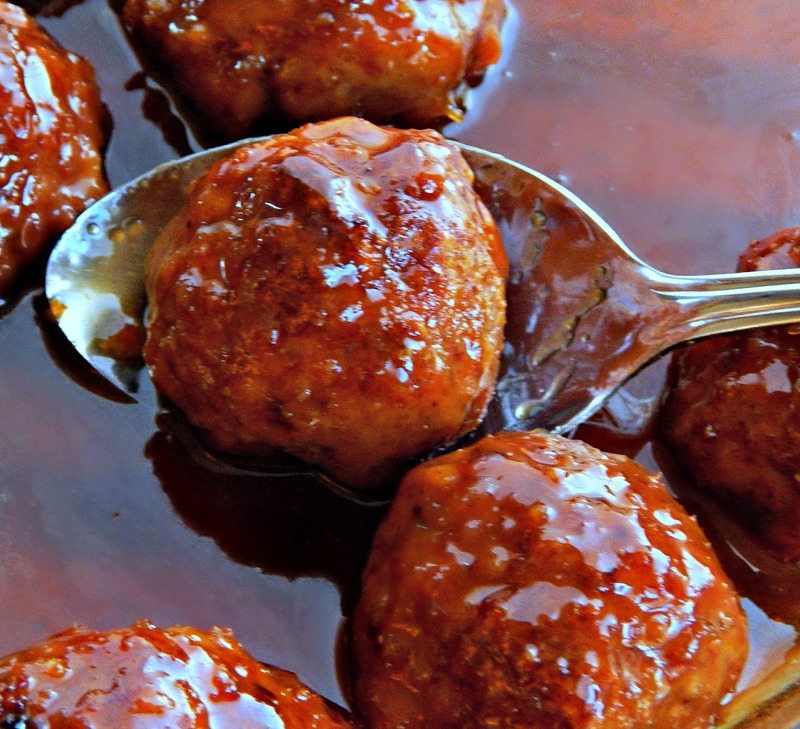 Our family has always made them in one form or another, although I don’t think I’ve had one for 40 years… The glaze just “makes” them and that sweet/sour with the hint of clove & allspice in the ham balls is heavenly. Some people make that glaze with tomato soup or ketchup…and it’s so wrong! Some people use pineapple which is more recent but interesting! I’ve never had ham balls but as you say, I’m not from Iowa 🙂 I admit I’m not much of a ham fan but I’d be willing to give these a try for sure! Thanks for sharing at Fiesta Friday. 🙂 Thanks, Ronit! They’re really very tasty. You are too funny Mollie! I have never heard of these but I LOVE that I have a new recipe for leftover ham. I get so stuck on what to do with it, thanks! Heehee! You had me giggling all the way through. I’ve only had ham balls once, but they were really pretty good! I do kind of love them, just don’t like to admit it, Carlee! But now I’ve outed myself, lol!